Plastics are everywhere around us, but how much do you actually know about them? Let’s take an in-depth look at this incredibly important, abundant material. We’ll discuss how they are created, identified, and categorized. Plastics are synthetic materials that originally derive from organic products such as hydrocarbon fuels (coal, natural gas, and crude oil), salt, sand, and a number of other possible constituents. Production begins with the processes of distillation and cracking in an oil refinery in which fractal groups of successively lighter hydrocarbon compounds are separated from the aggregate of raw material. Of particular interest to the plastic industry is a range of refined hydrocarbon distillates known collectively as Naphtha and used as key contributors in the manufacturing process for plastic polymers (examples include ethylene C2H4, propylene C3H6, and butene C4H8). 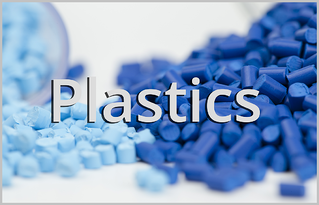 Most plastics are created in one of two major processes: polymerization or polycondensation - sometimes known as chain growth and step growth polymerization respectively. In both cases, petroleum distillates are combined with specific catalysts to create novel, typically larger, molecules. Both processes occur in a reactor where heat is added causing small molecules to combine into larger ones (known as plastics). The resultant large molecules have unique properties depending on the specifics of the process. Want a more in-depth explanation? Read below to understand the chemistry behind the creation of plastics. Categorization as either a thermoplastic or a thermoset has to do with the way the plastic, once created, responds to heat. Thermoplastics: Plastics that can be heated to their melting point, cooled, and re-heated again without significant degradation. Instead of burning, thermoplastics liquefy, allowing them to be easily injection molded and then subsequently recycled. Examples include two plastics very common to injection molding (ABS and Polyoxymethylene, i.e. POM or Acetal). Thermoplastics are much more common than thermosets. Their structure involves a series of repeat units combined together into a single molecule organized in a linear sequence. Thermosets: Plastics that can be heated only once (typically during the injection molding process). The first heating causes thermoset materials to set (similar to a 2-part epoxy) resulting in a chemical change that cannot be reversed. If you tried to heat a thermoset plastic to a high temperature a second time it would simply burn. This characteristic makes thermoset materials poor candidates for recycling. Examples include Polyurethane (PUR). The molecular structure of thermoset plastics is a two- or three-dimensional network as opposed to one-dimensional linear chain (as in the case of thermoplastics). Categorization as an amorphous material or a semi-crystalline material has to do with the molecular structure of the material. Amorphous (“shapeless”) materials lack the long-range symmetry or ordered structure of crystalline materials. As a result, Amorphous materials gradually soften as heat is applied. Semi-crystalline materials, by contrast, have a more ordered structure and exhibit highly sharp melt points (meaning they transition from solid to liquid over a very small temperature range). Semi-crystalline materials will stay in their solid state until a certain amount of heat is absorbed at which point they will rapidly transition into a liquid. Categorization as a homopolymer or a copolymer has to do with the monomer make-up of the final material. A monomer is smaller molecule that binds to other small molecules (other monomers) to make a larger molecule (polymer). Think of monomers as the simplest repeating unit (small molecule) in the makeup of a larger molecule. If the final plastic is made from a single type of monomer then it is classified as a homopolymer. If the plastic is made from a combination of two or more different types of monomers then it is classified as a copolymer. Plastics are used virtually every day by much of Earth’s population. They have a diverse range of applications across a vast number of industries. In the prototype design, manufacturing, and injection molding industry we interact with plastics on a daily basis. Some plastics are useful for engineering purposes (the engineering plastics), while others are readily available in manufacturing, or are easily machined or 3D printed. Availability and feasibility of use throughout the design and development process, in addition to suitability for use in the final product, can have a significant impact on the plastic you choose for your products. Have some questions or need a plastics recommendation? Contact us today! Chain-growth polymerization involves the combination of one monomer with another, followed by the sequential addition of further monomers to the base group. The result is a long polymer chain with unique characteristics (size, structure, and chemical properties). The molecular bonds are made through radical reactions (that is, they involve molecules or atoms with unpaired valence electrons). Chain growth polymerization typically involves double or triple carbon bonds as the molecular backbone of the larger structure and does not involve the loss of molecules during its synthesis. Step-growth polymerization involves a series of successive reaction stages in which smaller molecules (typically monomers that include heteroatoms like Oxygen and Nitrogen) combine by joining with an adjacent monomers to create a dimer (“two parts”) and a by-product (condensate). Dimers can become trimers (“three parts”), tetramers (“four parts”), and so forth. Step growth polymerization typically involves the loss of small molecules during synthesis (generally water is released as a condensate), or the final molecule contains heteroatoms (atoms other than Carbon and Hydrogen) as part of their backbone structure. As a result of the condensate released during synthesis, plastics resulting from step growth polymerization are often called condensation polymers.